A recent surge of worthy new email clients offers Mac users some of the best choices they’ve ever had for managing their mail. With a panoply of clever features and new ideas, these contenders have also mounted a serious challenge to the relatively stagnant Apple Mail and Microsoft Outlook. But with so may options to choose from, it’s now even harder to pick out the best email client for your particular needs. We’ve found one strong program that offers a great mix of features, usability, and value for a broad swath of users, plus several more that will cater well to more specialized preferences. Postbox 3 ( ) isn’t the newest or sleekest candidate in this roundup. Its design hews more closely to the traditional Mac look and feel, rather than adopting a slick iOS-like appearance. But for $10, it combines reliable performance, smart design, and a wide array of impressive features that make the program feel like what Apple Mail ought to be. Even though it’s built on Mozilla’s aging Thunderbird underpinnings, Postbox handled my email quickly and confidently. Setting up new POP and IMAP accounts went smoothly; in one case, when I tried to set up a work Outlook account, Postbox patiently guessed at several different IMAP configurations until it found the right one. It then filled up my new mailbox relatively quickly, despite the pile of messages involved, and let me track its progress with a clear but unobtrusive progress icon. Everywhere you turn in Postbox, you’ll find well-thought-out features that enhance your email experience. Message threads are easy to follow, with each message’s beginning and end clearly marked, and a quick reply box waiting at the end of the most recent message. An inspector pane next to each message shows you not only who sent it —and, with a click, their entire contact card from your address book—but breaks out any links, images, maps, or package delivery info it finds in the message. You can also easily search for any messages, images, or attachments from a particular sender just by clicking links within their address book info. And if work requires you to send a lot of form responses, Postbox builds in that ability. 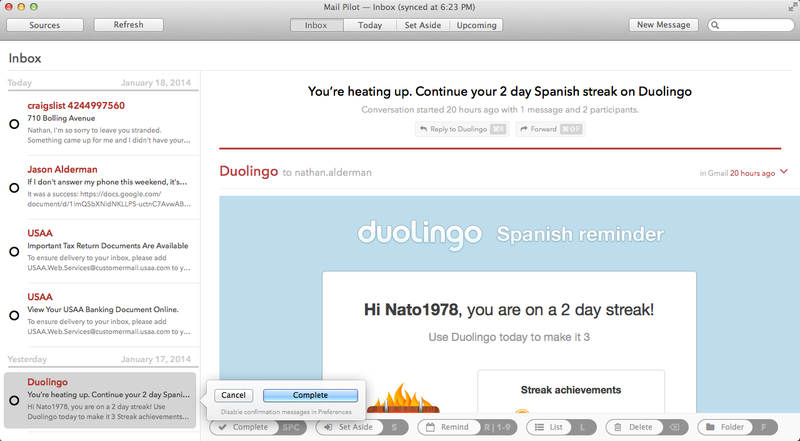 Just compose your response in preferences, then choose it from a pulldown menu when you’re writing a new email. 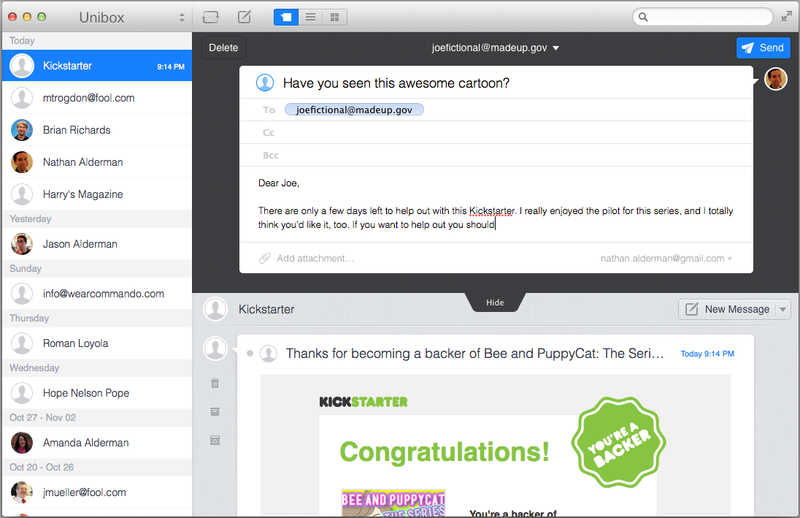 Postbox plays nicely with many popular social and productivity tools. If you have Evernote installed, Postbox can send emails to that service to help you keep track of them. Once you set up your account information, dragging and dropping files from your Dropbox will create links that let recipients download those files straight from your Dropbox account. And you can tie in your Facebook, Twitter, and LinkedIn accounts to not only get links to your contacts on those services, but post to all three directly from Postbox. The program will even use the Gravatar service to pull in images for your friends and acquaintances from one or more of those services. A helpful To-Do mode lets you create new tasks, or turn existing messages into tasks, then check them off as you finish. Postbox also integrates an RSS reader to keep track of your favorite feeds, an increasingly rare feature among modern email clients. And Postbox provides great support for Gmail, including the ability to use Gmail’s keyboard shortcuts. None of these features gets in the way of simply sending or receiving email, but they’re all readily available when you need them. Finding and using all these features can get a bit intimidating when you first start using it, but Postbox’s clear, straightforward, and easily searchable online help files make the learning curve much gentler. Postbox 3 has begun to show its age; OS X updates since its initial release have actually broken a few features, such as integration with the Mac’s Calendar. But overall, Postbox seems like the best mix of price, capabilities, and quality for the majority of Mac users. If you use email more for pleasure than business, you’ll likely enjoy Inky’s earnest efforts to present your inbox in ways that matter to you. Built for portability, Inky ( ) stores information for your POP and IMAP accounts—but not your mail itself—securely on its remote servers. Once you’ve set up that info, a single Inky login will bring all your email to any computer you’re using Inky with. 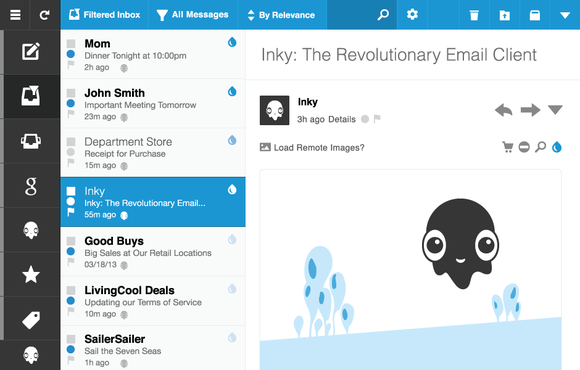 In a clean, colorful interface, Inky lets you view mail as a unified inbox, by individual accounts, or by several different clever Smart Views. The program’s smart enough to automatically recognize and sort messages containing maps, package info, daily deals, subscription mailings, and other common categories. By clicking icons on each message, you can also teach Inky how to rank your email by relevance, so that it’ll display messages that matter to you more prominently. I occasionally had trouble logging in to Inky, and had to quit and restart the program a few times to get to my mail. And Inky doesn’t offer business-friendly features like to-do lists, or any bells and whistles beyond sorting and handling email. But it’s free, it’s fun to use, and it’s full of well-executed and practical new ideas. 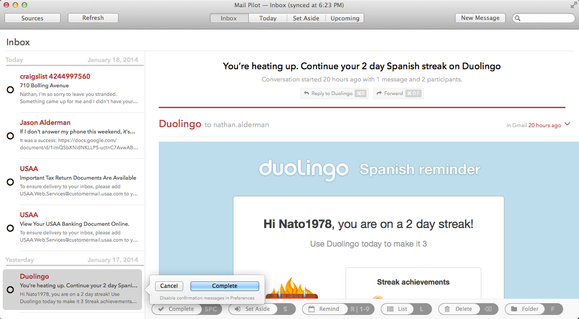 The same can be said for Mail Pilot ( ; Mac App Store link), a $20 email client built loosely around the Getting Things Done approach to productivity. It looks terrific, but for all its good qualities, it’s still missing a few crucial features. Mail Pilot treats your inbox as a to-do list. Each message is a task that you can check off right away, set aside until you’ve got the time for it, or ask to be reminded about on a certain date. Clearly labeled keyboard shortcuts at the bottom of the screen make these tasks easy to accomplish. It’s IMAP-only, and setting up your account ranges from simple (Gmail) to tricky (Outlook, although the program’s great help files spelled out exactly what I needed.) 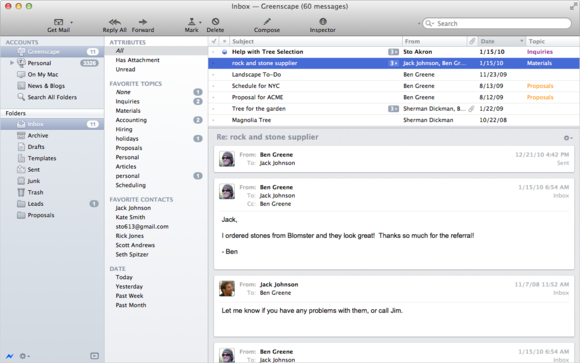 Once your mail’s in place, Mail Pilot offers lots of different options to navigate message threads. The variety puzzled me at first, but I came to appreciate the different ways it sorted and stacked my messages. As a fairly new program, Mail Pilot’s still somewhat under construction. The ability to save new messages as drafts or search by message text won’t arrive until a later version. But if you’re in synch with Mail Pilot’s productivity-first approach, you’ll nonetheless find the program helpful and worthwhile. Give it a few more versions, and Unibox ( ; Mac App Store link) could become quite the contender. Right now, it’s a very well-designed and usable $10 app with a few pesky hiccups. Setting up IMAP accounts is fast and easy, and once your mailboxes are populated, Unibox displays them not by message title, but by who sent you mail on a given day. From the top of the screen, you can switch between viewing each sender’s message thread, or seeing all the attachments or images in that thread by list or by icon. I really enjoyed Unibox’s sleek and efficient one-window interface, which makes maximum use of space while still displaying your mail clearly. The new message window slides down from the top of each message thread. Buttons to sort, junk, or delete a message materialize when your mouse hovers to the left of it; replying and forwarding options appear when you hover to the right. I wasn’t as fond of the blank screen Unibox displayed upon loading until I manually refreshed my mail. And it has a bad habit of truncating longer messages by default, forcing you to click again to read the whole thing. Still, it’s a smart program full of good ideas; it just needs a bit more polish. 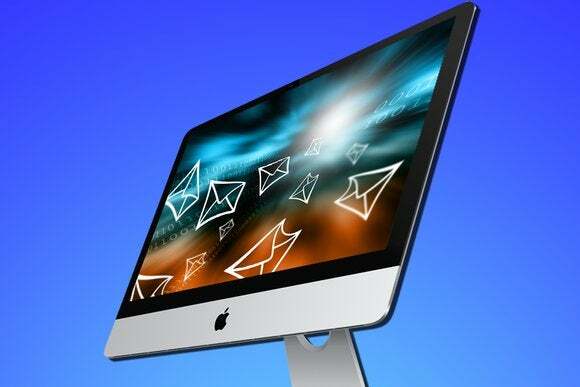 AirMail ( ) offers an attractive, inexpensive front end for your IMAP-based webmail of choice. But while the program’s interface is nice to look at, it’s not always easy to use, with tiny, hard-to-see buttons and space-hogging new message windows. Gmail messages also take an unusually long time to load; promised Dropbox support proved impossible to set up; and AirMail offers few help features. I used to love Apple Mail ( ) but it’s begun to stagnate with the last few versions of OS X (Mail is free with OS X Mavericks). The latest incarnation trickles in a few new features, including the welcome ability to search by attachments and attachment types. And, as befits an Apple program, it’s well-integrated with the rest of OS X. It’s also the only client in this review to natively support Microsoft Exchange accounts, although Outlook’s increasing support for IMAP renders that a bit moot. Alas, the latest version was plagued by troubles with Gmail, and Apple has released updates that address many of the problems. But wouldn't it be nice if it simply just worked? Like a mighty rhinoceros, the $30 MailMate ( ) won’t win any beauty contests; it’s not what you’d call “approachable”; and it’s astonishingly powerful. Its gray, austere, text-only interface conceals jaw-dropping abilities to search, sort, and sift massive piles of mail. Its support for SpamSieve and PGP, and its unbelievably granular search categories—like “level of server domain”—make MailMate the undisputed best email pick for power users, but probably a needlessly intimidating choice for everyday users. Even if you only want a simple, no-frills email experience, you don’t have to stick with Apple Mail. 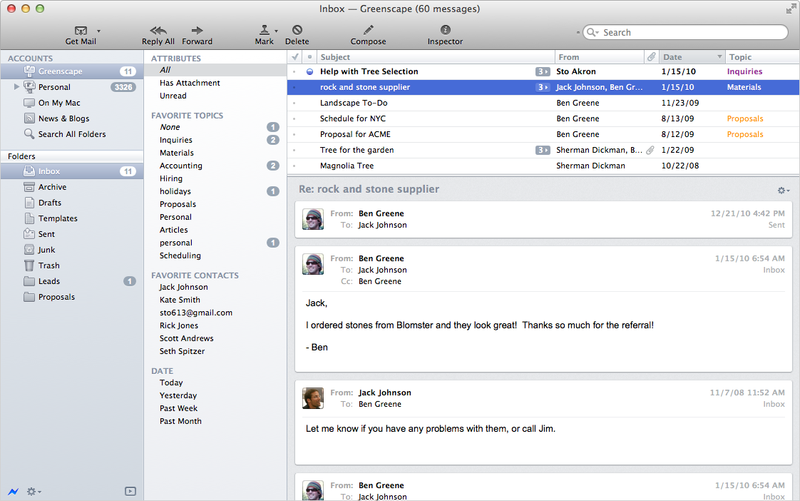 Inky’s a great free alternative for folks who just want a streamlined inbox presented in a friendly way. On the other end of the spectrum, MailMate is ideal for tech-savvy experienced users who want to rule their inbox like a cruel, all-powerful god. And right at the happy medium between those extremes, Postbox offers plenty of easy-to-use enhancements for a fair price.